George Graham Reviews Buddy Guy's "Living Proof"
It's an unfortunate fact of life that many rock musicians don't age very well. Rock, it its base, is the music of youth. There are exceptions to the rule, but most rockers peak earlier in life. On the other hand, there are genres of music in which age is an asset -- classical music and jazz are generally given more depth by the life experience of the artists. The blues is the same way. And this week we have a CD whose title exactly expressed that. It's called Living Proof, and it's by veteran bluesman Buddy Guy. George "Buddy" Guy was born in rural Louisiana in 1936, and as a youth made his own two-string guitar-like instrument. After being given a real acoustic guitar, he began performing with bands around Baton Rouge in the early 1950s. He moved to Chicago in 1957 and soon became an active part of the Chicago electric blues scene, where he became known for his distinctive guitar style. While signed to one label, Cobra Records, he used the pseudonym Friendly Chap while recording for a rival label in which he began his long association with Junior Wells in 1965. Guy was signed to Chess Records from 1959 to 1968, and because Chess Records founder Leonard Chess didn't care for Guy's guitar style, he only released one of Guy's albums during that period. Guy did serve Chess as a studio musician over the years backing up Koko Taylor, Howlin' Wolf, Muddy Waters and others. He also attracted the attention of the young British blues rockers like the Rolling Stones and Eric Clapton who were absorbing American blues and scoring hits among American audiences with their take on the blues. Guy was part of big show in the UK in 1969 with Clapton, Led Zeppelin, Stephen Stills and others. Since then, Buddy Guy's career has waxed and waned. Though he was acknowledged as a influence by some of the biggest names in rock at the time, general audiences were more interested in the rock versions than the authentic Chicago-based bluesman. But Guy himself moved in a rock direction more so than a number of his contemporaries. His guitar sound was said to have been an influence on a Jimi Hendrix when he was developing his style. Buddy Guy is known for his energetic stage performances. He kept up his collaboration with Junior Wells and released a number of joint albums that also turned out to be influential. 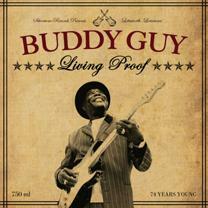 In recent years, Guy has been active recording, with CDs out in 2005, 2008 and now in 2010 Living Proof. Living Proof is an interesting release in that it was done in Nashville and has a couple of notable guest cameos: B.B. King and Carlos Santana. The CD was produced by the drummer on the session Tom Hambridge, who also wrote or co-wrote a fair amount of the original material, some in collaboration with Buddy Guy himself, and on other songs, co-written with Nashville songwriter Gary Nicholson. The band on the CD is fairly constant, also providing the backing for the guest artists. In addition to drummer Hambridge, David Grissom is on second guitar, Michael Rhodes on bass, and on keyboards, Reese Wynans, who was a part of Stevie Ray Vaughan's Double Trouble. Buddy Guy is known as an innovator on guitar, and it's good that there's an instrumental track on Living Proof. It's called Skanky and was co-written by Guy and Hambridge. Guy shows that though a septuagenarian he is still the guitar-slinger. Living Proof the new CD by veteran bluesman Buddy Guy is an excellent example of how in the blues, performers seem to get better with age. Guy is in great form, and his collaborator, drummer and producer Tom Hambridge was able to channel Guy's still abundant energy to best effect in this Nashville-made recording. The mostly new original songs are in the classic blues mode, but it's also a way to break away from just playing the old blues standard tunes. The band, including ex-Stevie Ray Vaughan keyboard man Reese Wynans is supportive and strikes the right balance between the all-out electric drive of Chicago blues and a degree of nuance that separates the best blues from all the rest. Our grade for sound quality is about a C-plus. Just because the old Chess records were poorly recorded with distortion, it's no excuse to make a 21st Century digital recording have the same deficiencies. And the heavy volume compression the CD can make the recording fatiguing after a while. Back in the 1960s, the British Blues-rock musicians looked upon Buddy Guy as a significant influence. At age 74, he's still at the top of his game.